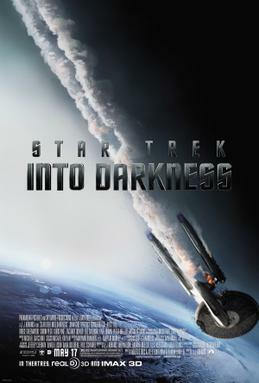 Star Trek Into Darkness 星际迷航：暗黑无界 (USA,2013) - 英语电影角 - 英语交流吧论坛 - Powered by Discuz! Star Trek Into Darkness is a 2013 American science fiction action film. It is the twelfth installment in the Star Trek franchise and the sequel to 2009's Star Trek. The film has received positive critical reception, with critics calling it a "rousing adventure" and "a riveting action-adventure in space". The film holds a 87% " Certified Fresh" rating on Rotten Tomatoes, based on 225 reviews with an average score of 7.5/10. The site's main consensus reads "Visually spectacular and suitably action packed, Star Trek Into Darkness is a rock-solid installment in the venerable sci-fi franchise, even if it's not as fresh as its predecessor." On Metacritic, the film has a score of 72 out of 100, indicating "generally favorable", based on reviews from 41 critics. It also garnered an average score of "A" from the market research firm CinemaScore. Cumberbatch's performance, in particular, drew praise from critics with Peter Travers of Rolling Stone magazine calling it a "tour-de-force to be reckoned with" and his character "a villain for the ages". Joe Neumaier of NY Daily News wrote that Cumberbatch delivered "one of the best blockbuster villains in recent memory". Jonathan Romney of The Independent specifically noted Cumberbatch's voice saying it was "So sepulchrally resonant that it could have been synthesised from the combined timbres of Ian McKellen, Patrick Stewart and Alan Rickman holding an elocution contest down a well". The New York Times on the other hand praised his screen presence saying "He fuses Byronic charisma with an impatient, imperious intelligence that seems to raise the ambient I.Q. whenever he’s on screen." Not all of the reviews were positive, however, with The Independent saying that the film would "underwhelm even the Trekkies." American film critic Lou Lumenick of the New York Post gave the movie one and a half stars out of a possible four and said it had a "limp plot" and the "special effects are surprisingly cheesy for a big-budget event movie." A. O. Scott dismissed the film in The New York Times, writing, "It's uninspired hackwork, and the frequent appearance of blue lens flares does not make this movie any more of a personal statement." The film also received criticism regarding a scene which involved Alice Eve's character Dr. Carol Marcus in her underwear. Many deemed it to be "wholly unnecessary", "gratuitous" and misogynistic. Screenwriter and producer Damon Lindelof apologized for the scene via his Twitter account saying "I take responsibility and will be more mindful in the future". Director J.J. Abrams, on his appearance on Conan addressed the matter by debuting a deleted scene of Benedict Cumberbatch's character taking a shower. Despite an acclaimed performance from Cumberbatch, Christian Blauvelt from website Hollywood.com criticized the casting of Khan in Star Trek Into Darkness as being "whitewashed into oblivion". There have been similar accusations of "whitewashing" by fans and American Sikhs with  Star Trek: Voyager actor Garrett Wang tweeting "The casting of Cumberbatch was a mistake on the part of the producers. I am not being critical of the actor or his talent, just the casting." The USS Enterprise has been sent to a planet in the Nibiru system to observe a primitive civilization. Captain James T. Kirk violates the Prime Directive when First Officer Spock's life is jeopardized by an erupting volcano, exposing the Enterprise to the planet's civilization during the rescue. Called back to Earth, Kirk is demoted and ordered back to the academy, however Admiral Christopher Pike, reinstated as commander of Enterprise in Kirk's place, talks his superiors into offering Kirk the position of first officer of the Enterprise. The two attend an emergency meeting at Starfleet Command to discuss the bombing of a secret Section 31 installation in London, perpetrated by former Starfleet agent John Harrison. The meeting is attacked by a gunship piloted by Harrison, killing Pike. Kirk destroys the gunship, but Harrison escapes. Kirk is reinstated as the Enterprise's captain. After discovering that Harrison has fled to the Klingon homeworld of Kronos, Kirk receives orders from Admiral Alexander Marcus to hunt down Harrison. The Enterprise is supplied with 72 prototype photon torpedoes and ordered to fire them at Harrison's location once he is found. However, Montgomery Scott resigns in protest of the new weaponry, and Spock, Dr. Leonard McCoy and Uhura convince Kirk to capture rather than kill Harrison. Arriving on Kronos, Kirk, Spock and Uhura set out to capture Harrison but are intercepted by Klingons. Harrison kills the Klingons almost single handedly and surrenders after learning that the prototype torpedoes are aimed at him. Returning to the Enterprise, Harrison reveals his true identity as Khan, a genetically engineered superhuman who was awakened from a 300-year-long period of suspended animation by Admiral Marcus to develop advanced weapons for a future war between the Federation and the Klingon Empire. The torpedoes are found to contain cryogenic pods with Khan's crew inside, who had previously been held hostage by Marcus. The Enterprise is soon intercepted by an unmarked Federation warship, the USS Vengeance, designed by Khan and commanded by Admiral Marcus. Marcus demands that Kirk hand over Khan, but Kirk refuses. The Enterprise starts to warp to Earth to have Khan stand trial, but is attacked by the Vengeance mid-warp, exiting 237,000 kilometres from Earth. With the Enterprise severely damaged, Kirk offers to hand over Khan and the cryogenic pods in exchange for the lives of his crew. Marcus refuses, revealing that it was his intention all along to destroy the Enterprise in his plan to dispose of the superhumans and start a war with the Klingons. The Vengeance prepares to open fire, but suffers a power outage caused by Scotty, who infiltrated the ship after following coordinates to Jupiter given by Khan to Kirk. Kirk, having left Spock in command, joins Scotty on the Vengeance after a space-jump with Khan from the Enterprise, and they take control of the bridge. Feeling Khan to be untrustworthy, Kirk and Scotty attempt to incapacitate him but are overpowered. Khan then kills Admiral Marcus and takes control of the Vengeance. Khan negotiates with Spock, beaming Kirk and his boarding party back to the Enterprise in exchange for the torpedo/cryo-pods, planning to destroy the Enterprise. Spock, incapable of lying, acknowledges to Khan that those were his torpedoes but, did not volunteer that the torpedoes were activated and that he had ordered Dr. McCoy to remove Khan's crew from them, keeping the cryo-pods on the Enterprise. Spock reasoned that this subterfuge was necessary, having learned from Spock Prime (the older version of Spock from an alternate future timeline) that Khan Noonien Singh from his timeline was tyrannical and could not be trusted, and was finally defeated, but only at "great cost." The torpedoes incapacitate the Vengeance, and both damaged starships start descending towards Earth. Kirk re-aligns the Enterprise's warp core, enabling the crew to regain control of the vessel, but suffers fatal radiation poisoning in the process and dies. Khan intentionally crashes the Vengeance in downtown San Francisco, where Spock is transported down to pursue Khan on foot. McCoy's experiment on a Tribble reveals that Khan's blood contains regenerative properties that may save Kirk. McCoy thus orders Kirk to be immediately cryogenically frozen in order to preserve his brain function. Uhura beams down to prevent Spock from killing Khan. One year later, a revived Kirk addresses a memorial of the events. Khan has been resealed in his cryogenic pod and stored away with his crew. A rebuilt Enterprise then departs for a five-year mission of exploration. GMT+8, 2019-4-23 06:46 , Processed in 0.152541 second(s), 40 queries .